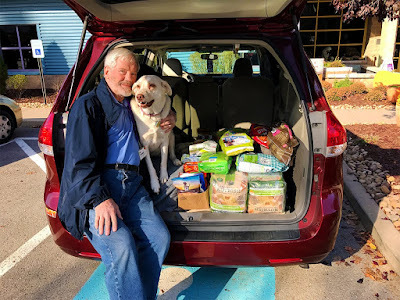 Chow Wagon Volunteer Jim Stocker loads his van full of donated pet food to deliver to food pantries with the help of his dog, an Animal Friends alumni! Since 2007, Animal Friends’ Chow Wagon program has delivered donated pet food to local food pantries. It started with just one pantry nine years ago. Since then, it has grown to serve 29 pantries and two Meals on Wheels programs! Each month, thousands of pounds of pet food are delivered to food pantries around the greater Pittsburgh area. This service is only possible with the help of a dedicated team of volunteers. Perhaps no volunteer better demonstrates this dedication than Jim Stocker. Jim is from the South Hills and has been volunteering at Animal Friends for almost five years. As the Chow Wagon program expanded to serve more food pantries, he happily stepped in to lend a hand. Though he started out as substitute delivery driver, Jim has increased the number of locations to which he regularly delivers. Now he is able to deliver to not one, not two, but three food pantries! In addition to making regular deliveries, Jim also picks up Petco Foundation pet supply donations from multiple Petco stores. Whenever the donation bin at the store is full, Jim is there to deliver it to Animal Friends. We at Animal Friends are grateful to all of our wonderful volunteers, like Jim, who are committed to improving the lives of all pets. If you’d like to help with our Chow Wagon program, contact Rachel at RMartone@ThinkingOutsideTheCage.org for more information. Pets for Vets Pittsburgh: Our First Match!